We’ve Invented Futuristic Flippers — Why Aren’t the SEALs Using Them? Imagine you’ve developed a device that lets swimmers and divers swim dramatically farther and faster — and with less fatigue than traditional fins. Imagine your device, which is easy to learn and simple to operate, lets divers achieve speeds and ranges equal to those of powered underwater scooters. Imagine professional divers enthusiastically recommend your device and use it, and you receive positive media coverage. You’d think the SEALs would be pounding on your door with a check ready, right? Hydrofoil boats were once as much a symbol of The Future as monorails, but like monorails, their real-world success has been spotty. High fuel consumption hastened their decline as much as changing tastes in transportation. 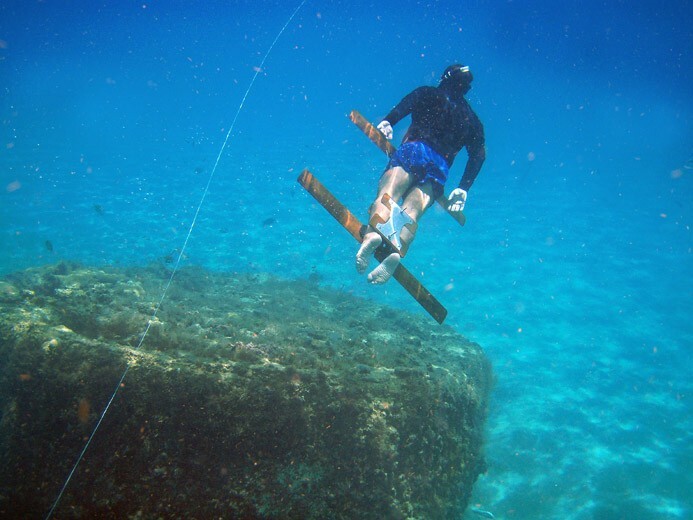 During the peak of the hydrofoil’s popularity, however, the foil concept was also applied to human-powered aquatic propulsion. How much power? Swimmers can reach five to six miles per hour using such a device. At slower speeds, endurance can be measured in hours, not minutes. The application of foils to swimming goes back to mid-century Southern California and an American original. Calvin Gongwer received a BA in mechanical engineering from Columbia and his MA in aeronautical engineering at Caltech, but never worked as an aeronautical engineer. From school and GM’s Lubrication Lab he went New London, Connecticut, to work on anti-submarine warfare efforts during World War II. After the war, he joined Aerojet General as a hydrodynamicist. Calvin counted his invention of Alco propellant while at Aerojet as one of his best efforts. Alco instantly and completely roars into a ferociously hot fire — perfect for igniting solid-fuel rocket motors, which must get lit up evenly and at once. Alco propellant is used to fire off everything from rocket-propelled grenades to space boosters. Another, the “Aquaped,” was something like an underwater recumbent bicycle — the diver lay on his stomach pedaling a pair of angled, counter-rotating props. For Aerojet, Gongwer created a two-man mini-sub with odd-looking fins which starred (briefly) in a B-movie sea monster’s demise. The Aqueon consists of a pair of foils connected by a rod, spring and rope. Its deceptively simple layout and old-fashioned wood-and-metal construction mask its sophistication. The swimmer grasps the device between her thighs (no strapping in) above the rear fixed foil, and with a kick stroke sets the forward oscillating foil moving. The rod positions the forward foil at and beneath the swimmer’s center of gravity, which looks weird but dramatically reduces torque and fatigue. Users then and now noted the ease with which the Aqueon can be donned and doffed, and how well it collapses for transport. Calvin started Innerspace Corporation in 1960 to market the Aqueon. The device’s manifest superiority in speed and range was put to the test in a number of formal and informal demonstrations. In one test conducted by the U.S. Navy, a pair of Underwater Demolition Team divers swam 1,500 yards with fins; the first trial took 45 minutes and left them exhausted. The second trial took place two hours later; the swim using Aqueons took 24 minutes and left the divers ready for more. The Navy frogmen were in no doubt of the military utility of such a device. Calvin calculated that an average swimmer could catch an Olympic medalist in 25 yards from a standing start. That was almost 50 years ago, when the Navy was revolutionizing underwater work and life. With the establishment of the SEALs and the SEALAB program, you might expect that a revolutionary swimming aid would have swiftly — if quietly — found a market. But despite the demos and rave reviews, no one at the Pentagon ever ran (or swam) with Calvin Gongwer’s idea. Nowadays Innerspace Corporation makes its living manufacturing advanced propulsion systems for underwater drones and subs, and occasionally sells a few Aqueons to curious enthusiasts. Ron Smith has developed a line of monofins he’s sure are the next step in underwater propulsion, and fellow freedivers are eagerly acquiring them for training and competition. The DOL-Fin Orca is a high-performance freediving fin that has set multiple records in competitive freediving. Other forms of the DOL-Fin systems have been tailored for scuba diving. “For a given SCUBA configuration and level of swimming effort, the DOL-Fin will likely propel a diver 60 percent to 90 percent faster than typical dive fins would achieve,” says Smith. Having solved how to mount an oscillating foil on a diver’s feet, Smith is still puzzled by the slow adoption of foils, given their many advantages over fins. Foils’ stiffness and shape require more skill to maneuver, and the speeds they permit demand greater attention to streamlining. Yet the results are dramatic. But the fins are still rare: few scuba divers have purchased DOL-fins and no one from the Pentagon has called for a test-dive. Our era often confuses fact with fantasy, and illusory advances with real possibilities. Mythical creatures like mermaids capture the public’s imagination — the forgotten past is spun into future promises. You can’t completely ignore a good idea, though. In 2007, the Pentagon’s scientists at DARPA announced they were developing the PowerSwim, a revolutionary new swimmer propulsion device. Consisting of fixed and oscillating foils connected by a rod, a spring and a rope, DARPA scientists boasted their device would double military swimmers’ speeds and endurance using muscle power alone. If the PowerSwim is in use by U.S. Special Operations forces, we won’t know. But it probably isn’t.